New Orleans: food capital of my world. Hot, spicy, sweet–the most flavorful mash-ups of bread and meat (well, fake meat now) and beans–it’s just the most delicious city ever. When I first visited six or seven years ago I definitely didn’t appreciate it like I should have, but since then I’ve fallen head over heels with the cuisine. Vegan po’boys are the jam, and vegan gumbo? Don’t get me started. Throw in some perfectly cooked collards and a side of rice and beans and I’m in heaven. 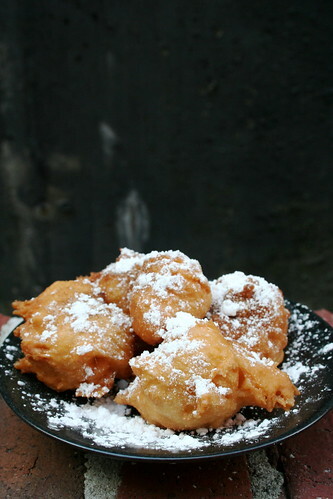 But then, don’t forget, there’s the beignet, the fried creole doughnut. Cafe du Monde, where would I have been without you? Sadly I don’t have the files of pictures from that trip, but let’s just say that at least half of them are of me and mother sitting in Cafe du Monde with powdered sugar all over our faces. It was beautiful. We also hit the city during a freakish cold spell, so every morning we would wake up, walk over to Cafe du Monde, order hot chocolate and beignets and watch the city wake up in the chilly, October air. I haven’t had a beignet since I went vegan 2 years ago, so when I had the excuse yesterday to make some I jumped at it. My friend’s sister wanted to learn how to bake dairy-free desserts so we spent the afternoon drinking Muscadine wine and whipping up beignets and banana pudding. We then finished up the day with some awesome Pizza Fusion vegan cheese action (portobello mushrooms, spinach, and pineapple–le yum!). But back to the beignets. I used Bryanna’s recipe, and wow, they taste just like the ones I gnoshed on back in ‘Nola. Light, airy, and sweet, I couldn’t get enough of them. Bryanna suggested just putting some cinnamon sugar on top, which was good, but I definitely recommend going all out and using powdered sugar. Her recipe also called for all whole wheat flour. Sorry Bryanna, but I believe too much in eating unhealthy sweets. I’m sure the wheaty ones would be good, but I was going for a pure white vibe. Even this morning, the slightly soggy leftovers tasted heavenly with fresh brewed coffee. The recipe was easy to make, easy to fry (yeah 1970s Fry Daddy! ), and all too easy to eat. I definitely recommend it! In a large mixing bowl, stir together the oil, maple syrup or sugar, salt, water, milk and yeast. Let sit 5 minutes. Slowly beat in the flour with a heavy spoon until you have a dough that can be dropped from a spoon. After 20 minutes or so, heat oil to 365 degrees F. Drop the dough by spoonfuls into the hot oil. Don’t crowd the pan—they will expand quite a bit. When golden brown on all sides, remove from the oil and drain on paper. Sprinkle with powdered sugar and eat hot! oh man, Jes – you make New Orleans sound like the tastiest place, fo ‘sho! vegan gumbo ‘n po boys sound so damn delicious! mmmmmmmmm! i’ve never heard of beignets, they sound sooo gooooood – and they look amazing & awesome! hellz yeah! also, beignets & hot chocolate sound like one helluva tasty combination. i bet i can make these gluten-free and i can’t wait to try ‘em out! you better believe i’ll be using a gluten-free white flour, too – i hear ya on go’n all out for desserts! nice! Wow! There is nothing else to say. Wow. Your beignets are awesome! I just made jambalaya today and your description of new orleans food is making me hunnnngryyyy! I could maybe sort of possibly perhaps overlook my avoidance of deep fried food and make those beignets too because I trust bryanna’s recipes so and they do look SO good. I want powdered sugar face, too! i just wanted to thank you for ruining my diet btw. ha who am i kidding?! i love you! mm… there are these hawaiian donuts called malisadas that are kind of like beignets… I never thought I could duplicate them! I must try these! you are killing me! that looks so good, i want some beignets now!! Oh yum! My fave veg*n restaurant serves them up, but they’re not vegan. Really must clue them in to this post! I did go door-to vegan restaurant-door yesterday, and I’m pretty hopeful one of them will hire me. I can’t thank you enough for this recipe. My GF is from southern Louisiana, and she’s been asking me to make her beignets for months. I’m going to surprise her one day with these bad boys. I agree, sweets shouldn’t be to healthy. Especially when we can have beignets like these. hi. i would like to make these for a party. do you think they can be made ahead and reheated before serving? thanks for the great recipe! looking forward to trying it. You can reheat them, but they aren’t quite as wonderful that way. The fried crunch will dissipate–but they’ll still be delicious!